A few days ago I shared some pictures of my dining room in it’s current state. Today I thought I would share with you a few of the changes that I want to make. I’m definitely looking for more comfortable seating, new pillows for the window seat, an area rug to ground the room, and I decided a new (and by new I mean thrifted) sideboard was in order. This photo from Southern Living embodies exactly what I’m looking for. I want two benches on either side of the table, and two wing back chairs at each end. My husband decided that we could build two benches for $200 or less, which is what it would cost to get the matching Ikea benches that go with our table. The Ikea benches are only 62 1/4 inches long, and our table is around 95in long. Going the DIY route will get us longer/wider benches, which means more comfy seating. The wingback chairs are going to be thrifted, and they shouldn’t be hard to come by. I collect chairs like most people collect tea cups. Chairs find me. It’s a gift, really. I’m toying around with the idea of reupholstering the chairs (which I haven’t found yet) myself, or depending on the fabric trying to paint them like this clever lady did. Genius! I would also like to add an area rug to the space. 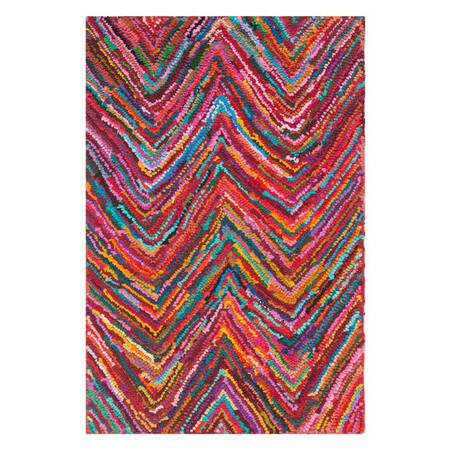 I think a rug would help ground the room, and it’s also another way for me to pull more color and pattern into the room (It’s clearly lacking in both departments) I recently spotted this rug from Joss & Main, and I think it’s definitely what I’m leaning towards. Naturally I’m leaning toward a pretty eclectic mix of pillows for the window seat. It’s not easy to find great looking pillows in a purple scheme, so I like the idea of the muti-color rug so that I can pull colors from that. Wish me luck-I’ll keep you posted on the updates as they happen! 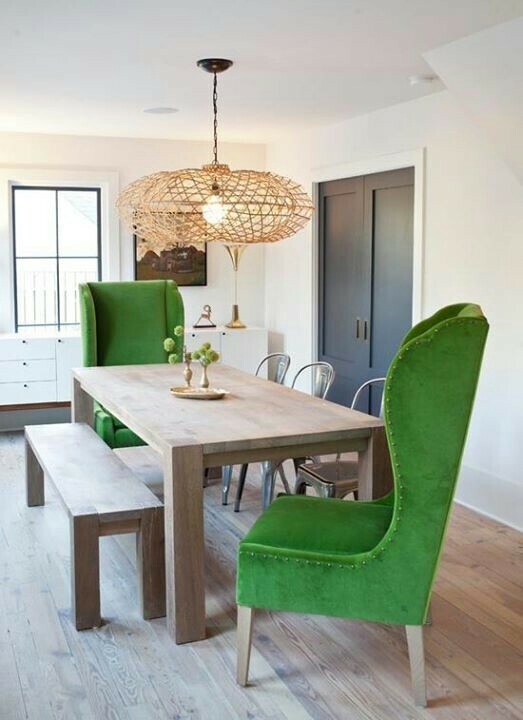 Everyone is thinking about dining rooms right now. Guess it’s time to get ready for the holiday season and meals! We’re doing a whole theme on dining rooms next week. You are right, Barbara! Tis the season for big family gatherings. I’ll look forward to your special dining room features!